Mommessin, an old wine maker situated close to the town of Mâcon in the Burgundy region of France. The Burgundy region is considered one of the top three wine regions in France for reds, but that whole concept of “top” is too suggestive. Suffice it to say, the Burgundy region is probably the most diverse. From Chablis to Beaujolais the region’s appellations and wines vary greatly. This wine from Moemmessin comes from the highly regarded Beaujolais region and while most people know Beaujolais for their Nouveau’s, the real first class wines from this region are the Cru Beaujolais. 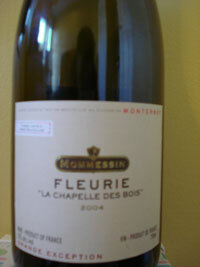 There are ten Crus and this wine comes from the Fleurie part. Unlike most wines from the Beaujolais region, Crus are more robust, stronger and can be aged longer. Also, unlike northern Burgundy reds which are primarily Pinot Noir based, the Beaujolais region is uniquely Gamay only. This wine is 100% Gamay. First smell was fruit, fruit and fruit. The fruity nose was distinctive with strawberries being the only discernible scent. The colour was balanced and not too “purple” for a fruity wine, almost a hint of rust on the edges. Initial sips and chews brought forward a nice mix of berries and a hint of flower. Reading the label tells me the flower smell is close to violets and peonies, I will trust the winemaker’s nose on this one as I all I noticed was a hint of flower to go along with the soft berries. The taste of oak followed with several more tastes, but not an overwhelming oak, a nice compliment to the existing flavours in my mouth. The finish was smooth and solid with the tannis being well behaved. I think what I liked about this wine more then anything is that it is completely balanced, from aromas to tannins to colour. This is the well polished Mercedes c240, not too expensive but many years of fine automaking has yielded a fine product with good heritage. This wine has earned it’s 88. This entry was posted in Burgundy. Bookmark the permalink.